Tis the season to be grumpy, and nobody complains like a gamer (or spits their pacifier out/throws their toys out of the pram). Now there are plenty of reasons to complain about a game (micro-transactions, pay-walls, pay-to-win, gorily-detailed hunting, forcing developers to censor their games after signing exclusivity contracts, etc), but some are more valid than others - and yes, we are looking very pointedly at the developers of Playing History 2: Slave Trade here. Anyway, before we get into the meat of the show there’s a bit of time for Producer Rob to introduce to the joys of Moonlighter - an indie dungeon crawler with shop mechanics from Digital Sun and 11 bit Studios that he’s bee addicted to recently. 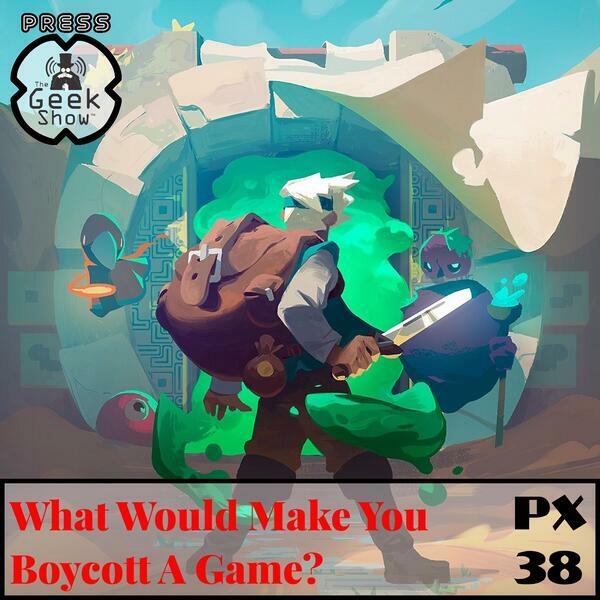 After that it’s time for Andy and Mark to join the fray for this week’s big question - What Would Make You Boycott a Video Game? If you've enjoyed this podcast then please share us with your friends or leave us a rating on your podcast app of choice. You can also follow us on Twitter @TGS_TheGeekShow, or on other social media by searching for The Geek Show. If you want to show your support then head over to Patreon and give whatever you can, or you can head over to The Geek Shop and partake in some of our lovely wares. Thanks, and until next time, don't play anything we wouldn't! PX30 - Are Google Making a Games Console? PX32 - What Games Are You Proud Of Completing?